You and your health system are an integral part of decreasing the current rate of 16,000 heart attacks and strokes across Minnesota each year. We work across our state to empower men and women age 50-69 to become aware of the risks of cardiovascular disease through conversations with their physicians. As well, we are reaching out to those in a position to influence this audience. 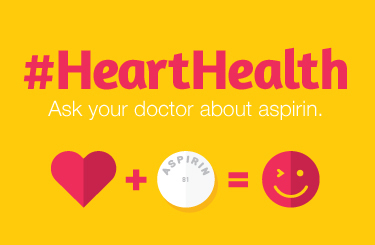 Download and use the resources below to help spread the word about the benefits of taking low dose daily aspirin. Seeking Branded Materials With Your Logo? Explore this quick guide to see how your logo could be added to posters, brochures, and social media content.